Posted on Sun, Apr 1, 2012 : 3:44 p.m.
Michigan linebacker Kenny Demens is sporting a hard cast on his left hand/wrist, as seen in a video of Saturday's closed scrimmage that was posted by the school. Michigan linebacker Kenny Demens tweeted this photo of his cast. Demens is shown making several plays with the first-team defense. The cast can be seen 9 seconds and 20 seconds into the video. The senior from Detroit Country Day tweeted about the cast in the wee hours of Sunday morning -- April Fool's Day -- and included an up-close photo of it. His first tweet said he was out of the season, but he later clarified that was a joke. "Ok...April Fools everyone. 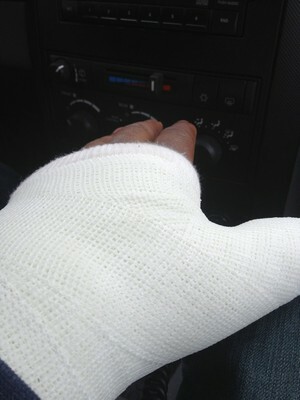 I'm not out for the season...only in a cast for a couple of weeks!!" he tweeted. Demens is an important piece to Michigan's defense. He has started the past two seasons at middle linebacker, and was the Wolverines' leading tackler last year. With three new starters on the defensive line, his presence in the 4-3 defense is key. Considering he's shown in the tape making tackles with the starters, it seems it's nothing to fret about with five months left until the opener against Alabama. He later tweeted at someone that he is practicing every day. Mon, Apr 2, 2012 : 4:23 p.m. I'm not so sure what is so exciting about this tape. It does not show any spectacular runs or plays. It appears that Hoke and Borges are not making any type of progress with this offense and with the recruiting slump we have now found ourselves in the recent last month or so, It's obvious the coaching staff has hit the ceiling in terms of their potential. Hoke and Borges have found themselves on the hot-seat this year because of that and it is put-up or shut-up time. So if they fail to drastically improve from last year there is a good chance we will be looking for another coach. Tue, Apr 3, 2012 : 1:46 a.m.
i'am not so sure what is so exciting about your post. it does not show any spectacular thought process about your evaluations and actually it is very dull and boring!! it appears that you are not making any progress in your postive posts about MICHIGAN and are in a very bad slump with your slanted and negitive posts towards MICHIGAN!! it is obvious that you can't hit any ceiling, but the floor is closer!! you have found yourself on the hot-seat and because of that it is time to put up for MICHIGAN or. . . well you know. . . if you fail to drastically improve your posts towards MICHIGAN there is a good chance you will be looking for a job at walmart!!! GO BLUE!!!!!! Mon, Apr 2, 2012 : 11:19 p.m.
Mon, Apr 2, 2012 : 8:25 p.m.
Good call Teddy! I think when you and Dave Brandon sit down at the end of the season to evaluate things, your input will be very important. The only problem may be your credibility as an M fan what with you heading up the Urby Lust Camp and all. But yeah, I'm sure your right. Hoke is on the hot seat. Hahahahahahaha!! Sun, Apr 1, 2012 : 10:39 p.m.
Kenny, joking about the term of your injury is no laughing matter. I think we'd all hate to see you get bitten by the karma bug. Mon, Apr 2, 2012 : 11:15 p.m.